GIMP is a comprehensive image editing program on the level of Photoshop, in fact it looks and works pretty much the same as Photoshop, with one major exception; Photoshop costs about $800.00 while GIMP is totally free! It can be downloaded from GIMP for Windows. GIMP is a powerful full-image processing application, and like all powerful applications, its complexity may seem intimidating to inexperienced users. However, you can quickly perform some common basic operations, like crop, flip, or reduce the file size of images without spending the time to completely learning every function of GIMP. This article will focus on how to scale an image. First let's answer the question; why would you want to re-scale an image? When you use your WYSIWYG webpage designer it lets you resize the image automatically. When you use your WYSIWYG publishing program it lets you resize the image automatically. Well, that's not exactly true. What your WYSIWYG applications are actually showing you are basically illusions. Your webpage design application sets the image width and height in an html img tag. This causes the image to be displayed by the users web browser in the size you desire, but the original oversize image still has to be transferred from your website to the users web browser. This makes the webpage load slowly. Similarly, your publishing program lets you set the size that the image will be printed, but the original oversize image is still embedded in your document. This makes the file size larger. So you want to re-scale the image to correct size outside of your WYSIWYG publication. 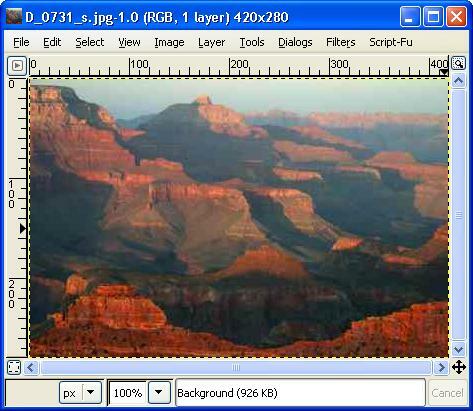 • To open an image in GIMP, In the Main Toolbox File menu select Open.... In the the Open Image dialog box that appears, navigate to the image file and select the image file name, then click on the [Open] button. The image shown here is a National Park Service photograph of the Grand Canyon.